By no later than March 8, 2017, hospitals and critical access hospitals (CAHs) will be required to give notice to Medicare patients who are receiving outpatient observation services. The Notice of Observation Treatment and Implication for Care Eligibility Act (NOTICE Act) was passed by Congress on August 6, 2015, and requires hospitals and CAHs to inform these patients that they actually have not been “admitted” to the hospital and what that means for the patient in terms of cost-sharing requirements and subsequent eligibility for coverage of services furnished by a skilled nursing facility. Under the NOTICE Act, hospitals and CAHs must provide written notice to Medicare patients who are in the hospital under observation status for more than 24 hours. The standardized notice is called the Medicare Outpatient Observation Notice (MOON). Notification must be provided to the patient no later than 36 hours after the time observation status begins. All hospitals and CAHs are required to provide the MOON, per CMS guidance, beginning no later than March 8, 2017. The MOON notice language and instructions in English and Spanish can be found on CMS's web site. 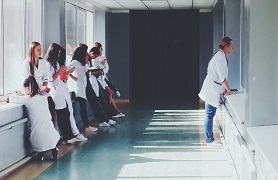 It will be considered a breach of a hospital’s Medicare provider agreement if a hospital fails to provide the MOON notice to applicable beneficiaries, and could further result in the termination of the hospital’s provider agreement. The NOTICE Act was passed by Congress in response to the growing trend among hospitals to keep patients in outpatient status with observation services rather than admitting them as inpatients, likely as a result of financial pressure on hospitals to reduce potentially preventable readmissions of inpatients. By way of background, Medicare Part A pays for inpatient stays. If you are hospitalized under observation status, payment by Medicare is under Part B, which covers physician and outpatient services. Patients without Part B coverage are often left with the bill for observation status, even though there was not a perceptible difference in the type or level of care they received in the hospital. The NOTICE Act aims to eliminate the confusion and surprise of out-of-pocket costs for Medicare beneficiaries who may not realize that spending the night in the hospital does not make them an inpatient of the hospital and such services may result in unexpected charges that are not be covered by Medicare. For questions related to the NOTICE Act, or advice on other health law issues, please contact Breanne M. Rubin or Kevin D. Devaney.